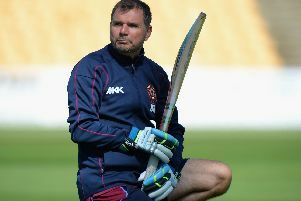 Steelbacks were left frustrated as their NatWest T20 Blast clash against Derbyshire at Queen’s Park in Chesterfield on Sunday was abandoned without a ball being bowled due to a waterlogged outfield. The North group leaders were hoping to be able to beat their hosts and pull a further two points clear of their rivals in the chase for a home quarter-final spot, but had to settle for a share of the spoils and a single point after the umpires Nick Cook and Neil Mallinder called the match off at the scheduled start time of 2.30pm. The sun was shining brightly and the pitch was playable, but the outfield was saturated. A statement on the Derbyshire website read: “The NatWest T20 Blast match between Derbyshire Falcons and Northants Steelbacks at Queen’s Park, Chesterfield, was abandoned without a ball bowled due to a waterlogged outfield. “The ground took on a vast amount of water in the days leading up to the match and, despite a dry matchday and positive forecast, the umpires deemed that the outfield was too wet for the fixture to take place. The abandonment means David Ripley’s men are three points clear of second-placed Birmingham Bears at the top of the North group, although the Bears do now have a game in hand. Northants are back in action on Monday when they begin a Specsavers County Championship Division Two match against Derbyshire, which is also scheduled to be played at Chesterfield. The Steelbacks then return to T20 Blast action on Friday when they host fourth-placed Notts Outlaws at the County Ground.